This church website project was created from the ground up. There was no existing website. We started with planning the website layout, which required several meetings to determine the needs of the church, and how to best communicate and prioritize the content. 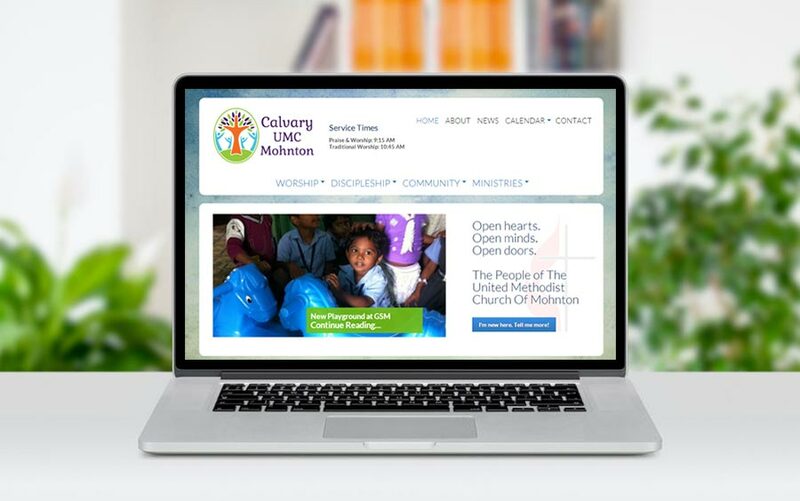 We accomplished all the church’s goals which included clean design, staff login capability to manage and write new content, photo gallery management, and integration with an enewsletter service to easily send church newsletters via email. Give McQ Web Design a call. You will be glad you did! Bill was recommended to our church when we were looking to set up a full fledged, professional website. So, we were starting from scratch. After a few initial meetings to discuss our needs and ideas, Bill designed the skeleton of our site, then worked with us closely to refine it to exactly what we were hoping for. All throughout the process, and since its completion, Bill has been highly responsive to our inquiries regarding updates, additions, and help questions. We value his professionalism and expertise greatly, so much so, that we continue to use his services to maintain our website’s security, maintenance, and web hosting, even though he has moved to FL and we are located in PA. Distance has not made any change to his focus on providing superior customer service. As Calvary’s Web Administrator, I would highly recommend retaining Bill’s services for your website, Whether you (or your business) are just starting out, looking to redesign your current site, or if just looking for a new set of eyes to tweak what you already have so that your site will work more optimally for you, give McQ Web Design a call. You will be glad you did.